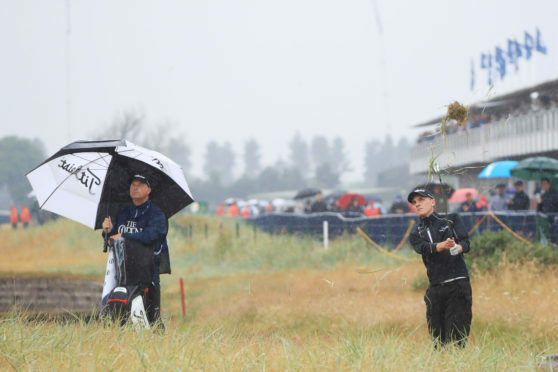 Sam Locke hits a shot from the rough on the 18th hole during the second round of the 147th Open. Stonehaven amateur Sam Locke became the first Scottish golfer to win the Silver Medal at The Open since 2005 – but feared he had missed his chance after a wayward drive at the 18th. The 19-year-old was the only amateur of the four in the field at Carnoustie to survive the halfway cut thanks to rounds of 72 and 73. He made the mark on three over par with nothing to spare and only after an agonising wait, having spent much of the day on the wrong side of the projected cut before scoring increased later in the day. Americans Zach Johnson and Kevin Kisner are tied at the top of the leaderboard on six under par with England’s Tommy Fleetwood among the group only one shot behind after shooting the lowest round of the day with a 65. Locke is also left flying the flag for Scotland as the only home player to make the weekend with Russell Knox, Sandy Lyle, Grant Forrest and Scott Jamieson all missing the cut. The Paul Lawrie Foundation player teed off in the first group of the day at 6.35am but it was not until well into the evening before his place in the weekend field was confirmed. Locke made a slow start with a bogey at the second followed by a double at the third before three successive birdies from the 13th moved him back to level par. But bogeys at 16 and 18 saw Locke drop to three over par for the championship and fearing he was going to miss out by one. Locke, the first Scot to win the Silver Medal since Lloyd Saltman 13 years ago, said: “I thought my par putt on the 18th was going to drop but it wasn’t to be. “I hit a pretty bad tee shot so a five wasn’t too bad. I could have been in the hazard or out of bounds. Locke hinted that he may consider turning pro following his success in his maiden major. He added: “I have been trying to push for the Walker Cup team next year but it all depended on this week. “You don’t know how things are going to go. Everything could click and you might turn pro straight after. “This game depends on your results because if you’re having bad results, you’re not going to go turn pro. Rory McIlroy was the last player to win the Silver Medal for leading amateur at Carnoustie in 2007. Tiger Woods, Justin Rose and Matteo Manassero are previous winners of the leading amateur prize.